Vintage pair of Antique Ceramic Elephant Statue/ Plant stands. There may be colour variations between your screen and the actual colour of the object. Total Length - 230mm. Total width - 110mm. The quality of the carving is very detailed and of a high standard, many of these stands have very poor carved details. A great useful and decorative item. The marble top has cracked in the past and has been repaired see photos. UNUSUAL PIECE OF FURNITURE IN THE ANTIQUE ORIENTAL STYLE. REALLY NOT SURE ON AGE. MADE USING PINE WITH CARVED. PANELS AND DRAWER FRONT AND FAB CARVED DRAGONS. THERE IS A COAT HOOK ON EACH SIDE. THE MAIN PANEL ON THE LIGHT WOOD PART. 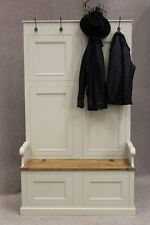 Superb example of a French 19th c. bamboo hall stand, umbrella stand, stick stand, coat hooks. Heavier quality and larger than often seen. x 201 high. Early Victorian Burr Walnut Inlaid Whatnot. An elegant original. 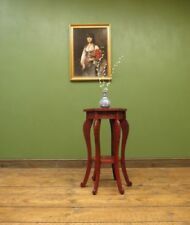 A stunning antique oriental jardiniere plant stand / lamp stand. Beautifully constructed. intricate carving. A great collectors piece. This antique carved hardwood urn stand has a marble top and is thought to be of Chinese rosewood. This one is beautifully balanced and has a great deal of visual and aesthetic appeal. ANTIQUE CAST IRON / BRASS UMBRELLA STAND SHOWING TWO BOYS HOLDING AND TWO BOYS RIDING ON DRAGON. The stand has superb carving all around the base and a graceful reeded central column mounted with a carved pedestal top. The stand is in excellent condition with only 2 small marks to the base and a slight crack to the pedestal. Asian Oriental Style Folding Plant or Cake Stand. Condition for age is good small fault to wood on handle as shown. Each stand is 23cm wide. There may be colour variations between your screen and the actual colour of the object. Total Length - 138mm. Total width - 82mm. There may be colour variations between your screen and the actual colour of the object. Total Length - 160mm. Total width - 100mm. There may be colour variations between your screen and the actual colour of the object. Total Length - 245mm. Total width - 165mm. It has the typical Liberty Arts & Crafts spade cut out so favoured by Archibald Knox in his silver work. A good looking understated piece, we have deep cleaned hand condition waxed and hand polished it from top to bottom. Due to Size this is a Collection only sorry - no postage but I will deliver in Swansea and limited surrounding area I’m storing it at relatives at the moment so please give me just a little notice if you’d to view. It measures 33x29x14” It was left in one of our commercial rentals and is in original untouched Unrestored condition and dusty on its original casters with umbrella drip trays , with signs of age and use. Please do take a look at the various photos for a better idea on condition and function. Many thanks for looking! A lovely vintage retro oak hall stand. We date this hall stand to around the 60/70s. The hall stand sits on a flat base which also houses the metal drip tray. The front has a left hand cupboard with an internal shelf. The rear is panelled. The rear panel houses an oblong mirror and is supplied with a total of three double pegs. The rear of the hallstand has a simulated wood vinyl covering. The very top of the hallstand has a brass spar shelf with further single hooks and the base shelf and cupboard top have marbled formica tops. The hall stand has a height of 71.5" (182cm), a width of 23.5" (60cm) and a depth of 11.5" (29cm). This lovely vintage hall stand remains in good solid condition with only very minor surface markings commensurate with age and usage. The mirror is showing a little bit of foxing. antique original 19th century oriental carved rosewood torchere stand. Fretwork detail with flower head and fruiting vine, with a circular veined marble top on 4 shaped legs united by cross stretcher. WITH 3 SHELVES HAND PAINTED WITH JAPANESE COUNTRY SCENE MOUNT FUJI IN BACKGROUND. Antique Umbrella Stand. Beautifully carved with fretwork and carved finial work to top, further fretwork surrounds a small inset mirror with small drawer to underside. Depth: 40 cm. Width: 44 cm. We have deep cleaned hand condition waxed and hand polished them from top to bottom, there are age related marks all, a small piece of timber missing here or there, structurallythey are stable. There are around 50-100 high definition super-sized pictures at the bottom of this page. Otherwise they are identical. There are around 50-100 high definition super-sized pictures at the bottom of this page. Width:- 32.5cm. This has a decent weight for the size. This has a carved flower maybe a Dahlia or peony. Old Oriental Hardwood Netsuke Stand. carved as a Rhino circa 1920's. approx 7 cm wide insert 4 cms long x 2 cms wide. The condition is pretty much perfect, we have wax polished and hand buffed it from top to bottom. 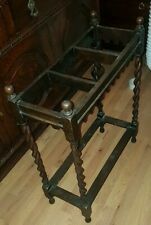 Large 19th Century - Umbrella/Stick Stand . Grand - Country House scale! A well made period piece with original Giltwood distressed finish, the top is solid marble, hand carved with a nice little recessed edge. This type of furniture was originally designed to seat a nice bust, plant or sculpture, now they are sold old and highly coveted that they are considered art furniture in their own right. Its been a little squashed on top at one point, the main body is card with a wood top. Width:- 40.5cm. Depth:- 40.5cm. Fine pair of art deco alabaster columns / torcheres / jardiniere stands / marble church flower stands. exact age unknown, believed to be early 20th Century. very heavy. very fine example of pair of church stands. Victorian alabaster carved corinthian column / torchere / jardiniere / church stand. very fine example of Victorian column style church stand. straight out of the church. used for flowers for weddings etc.